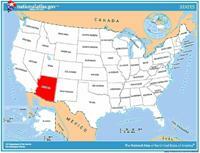 ﻿ Fun Easy English - Travel the United States of America - Arizona. Learn before you travel. This section of Fun Easy English focuses on facts and other cool stuff about your favorite U.S. state. This is great English reading practice. 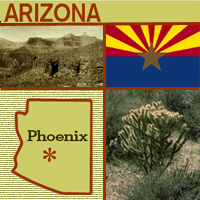 This page focuses on the state of Arizona. The state flag of Arizona "represents the copper star of Arizona rising from a blue field in the face of a setting sun" (quote from legislation). In 1911 a rifle team from the Arizona Territory was scheduled for a competition match in Ohio and needed a flag to represent their team. Charles Harris (the Adjutant General of the territory) quickly designed what was to become the Arizona state flag (Arizona was admitted to the Union in 1912 - this flag became the official flag of Arizona in 1917). The 13 gold and red "beams" or "rays" on Arizona's flag represent the sun setting over the western desert and the original 13 colonies (red and gold colors were also carried by Coronado's Spanish expedition in search of the Seven Cities of Cibola in 1540). The center star signifies copper production (Arizona produces more copper than any other state in the country). The field of blue is the same "liberty blue" as the United States flag. Blue and "old gold" are also Arizona's official state colors. Origin of Name Spanish interpretation of "arizuma," an Aztec Indian word meaning "silver-bearing." Also based on Pima Indian word "arizonac" for "little spring place." Travel and tourism site for Arizona - This state travel and territorial tourism site provides ideas for your vacations, meetings, and more. Waila music comes from the Tohono O'odham, the native people of the Sonoran desert and the largest Indian nation of southern Arizona. Waila (pronounced why-la) is an O'odham word that comes from the Spanish word "baile," which means "to dance." There are no words to waila music -- it is only instrumental, and is played on a button accordion, alto saxophone, electric six-string and bass guitars, and drums. The Grand Canyon is an immense steep valley in northwestern Arizona. Do you know what led the first European to go there? García López de Cárdenas, a Spanish explorer, was the first European to see the Grand Canyon, in 1540. He stumbled across it in his search for fabled cities thought to be filled with treasure and riches -- the Seven Golden Cities of Cibola. His journey was considered a failure because he never found the gold he sought. Native Americans, called the Anasazi, lived along the Grand Canyon long before Europeans ever set eyes on it. The Anasazi, who are thought to be the ancestors of the present-day Hopi, lived in caves and pit houses along the edges of the canyon in pueblos (towns). The Hopi believe the Grand Canyon is a Sipapu, a place from which all people emerged from another world into this one. What would you do to keep a legend alive? Would you dress up in old-fashioned clothing and follow old trails, sleeping under the stars? That's exactly what the Bill Williams Mountain Men do as they explore the mountains, canyons, and deserts of Arizona during their annual spring 200-mile Rendezvous Ride. The group is named after "Old Bill Williams," a legendary fur trapper who was born in North Carolina and traveled to the mountains of the West for adventure and to preach. It is believed Old Bill was killed in Southern Colorado in 1849. The Bill Williams Mountain Men wear buckskin outfits, hats and moccasins. They sleep under the stars and re-enact the rides of the early trappers who made their trips in the spring to sell their furs. These "Mountain Men" are businessmen, doctors, judges, and ranchers who do this to raise money for charities and scholarships for students. They also visit schools and hospitals to bring the story of Arizona's Western heritage to youth. They often take part in parades or presidential inaugurations, all in the effort to keep alive the memory and romance of an adventurous group of mountain men, particularly Old Bill Williams. 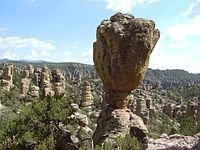 The following is a description of national forests, parks, and monuments in the state of Arizona. If you plan to visit or live in Arizona for awhile then you should definitely plan to visit some of these fantastic places. Encompassing the Mogollon Rim and White Mountains, this forest includes 34 lakes and over 680 miles (1,090 km) of rivers and streams, more than any other National Forest in the arid Southwest. This national forest is also partially located in the state of New Mexico. The San Francisco Peaks, Mogollon Rim, and Oak Creek Canyon can be found in Coconino National Forest. The forest's Sycamore Canyon is the second largest canyon in Arizona's redrock country. The forest also contains Humphreys Peak, which at 12,637 ft (3,852 m) is the highest point in Arizona. Covering the sky islands of the Southwest, Coronado National Forest also includes Mount Wrightson and the birding destination of Madera Canyon. 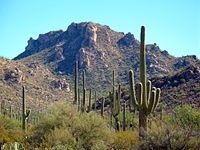 There are eight wilderness areas in the forest as well as observatories on Mount Hopkins and Mount Lemmon. This national forest is also partially located in the state of New Mexico. Located on the Colorado Plateau to both the north and south of Grand Canyon National Park, elevations in Kaibab National Forest reach 10,418 ft (3,175 m) on Kendrick Mountain in the Kendrick Mountain Wilderness. There are over 300 mi (480 km) of trails in the forest, including through the Kanab Creek Wilderness. Vegetation in Prescott National Forest ranges from that characteristic of the Sonoran Desert at lower elevations to Ponderosa pine at higher elevations. There are eight wilderness areas and 450 mi (720 km) of trails in the forest. Tonto National Forest stretches from the Sonoran Desert to the pine forests at the Mogollon Rim. There are eight wilderness areas and several lakes and reservoirs in the forest. The Grand Canyon, carved by the mighty Colorado River, is 277 miles (446 km) long, up to 1 mile (1.6 km) deep, and up to 15 miles (24 km) wide. Millions of years of erosion have exposed the multicolored layers of the Colorado Plateau in mesas and canyon walls, visible from both the north and south rims, or from a number of trails that descend into the canyon itself. This portion of the Chinle Formation has a large concentration of 225-million-year-old petrified wood. 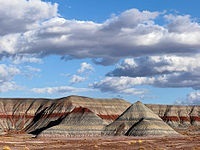 The surrounding Painted Desert features eroded cliffs of red-hued volcanic rock called bentonite. Dinosaur fossils and over 350 Native American sites are also protected in this park. Split into the separate Rincon Mountain and Tucson Mountain districts, this park is evidence that the dry Sonoran Desert is still home to a great variety of life spanning six biotic communities. Beyond the namesake giant saguaro cacti, there are barrel cacti, chollas, and prickly pears, as well as lesser long-nosed bats, spotted owls, and javelinas. Located within the boundaries of the Navajo Nation, it preserves the valleys and rims of the canyons of de Chelly, del Muerto, and Monument, all of which are Navajo Tribal Trust Lands. These pillars of rhyolite tuff are the eroded remains of an immense volcanic eruption that shook the region some 27 million years ago. 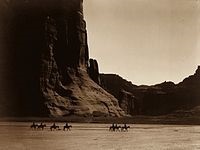 It was called the Land of the Standing-Up Rocks by the Apache. Located on the northern rim of the Grand Canyon, this diverse landscape includes an array of scientific and historic resources. About 20,000 of the monument's 1,017,000 acres (4,120 km2) are also within Lake Mead National Recreation Area; Grand Canyon-Parashant is not considered an official NPS unit. There are no paved roads or visitor services. Hohokam Pima is part of the Gila River Indian Community and not open to the public. The monument preserves the Snaketown-Settlement, archeological remains of the Hohokam culture, which lived in the area until 1500. 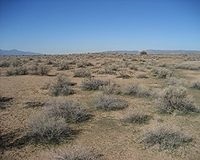 Located within the Sonoran Desert, significant concentrations of ironwood (Olneya tesota) trees and two endangered animal and plant species are found within the monument. More than 200 Hohokam and Paleoindian archeological sites have been identified from between 600 and 1450 AD. 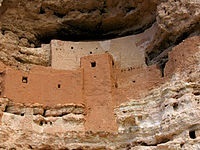 Montezuma Castle features cliff dwellings built by the Pre-Columbian Sinagua people between 1100 and 1400 AD. The site's name is a misnomer as is it has no connection to Montezuma. However, some modern day native tribes that do have connections to the site include the Yavapai, Hopi, and Zuni. 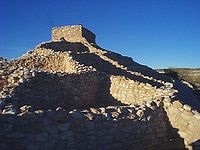 The monument also includes Montezuma Well, which has been used for irrigation since the 8th century. This monument preserves three of the most intact cliff dwellings of the Ancestral Puebloan people. The monument is high on the Shonto plateau, overlooking the Tsegi Canyon system on the Navajo Nation in Northern Arizona. This monument is the only place in the United States where the organ pipe cactus grows wild. There are many other types of cacti and desert flora native to the Sonoran Desert. The Bates Well Ranch and Dos Lomitas Ranch are also within the monument. Rich with Native Americans, early explorer and Mormon pioneer history, this site shows Ancestral Puebloans and Kaibab Paiute Indian and pioneer life in the Old West, including the cabin where explorer John Wesley Powell's survey crew stayed in 1871. The water of Pipe Spring, discovered in 1858, made it possible for plants, animals, and people to live in this dry desert region. This monument protects a small portion of the Sonoran Desert. It is home to several federally listed endangered species and also has three wilderness areas, many significant archeological and historic sites, and remnants of several important historic trails. Sunset Crater is the youngest in a string of volcanoes in the San Francisco volcanic field that is related to the nearby San Francisco Peaks. Final volcanic activity in the 13th century painted the upper portion of the cone with bright red and orange rocks, giving the volcano its name. Lying on the northeastern edge of the Sonoran Desert along the Salt River, Tonto preserves two cliff dwellings that were occupied by the Salado culture during the 13th to 15th centuries. 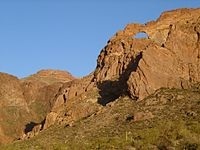 The monument is surrounded by Tonto National Forest. Tuzigoot preserves a two- to three-story pueblo ruin on the summit of a limestone and sandstone ridge in the Verde Valley. 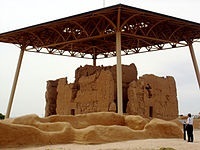 It was built by the Sinagua people between 1125 and 1400. Walnut Canyon protects 25 cliff dwelling rooms constructed by the Sinagua people. It lies on the Colorado Plateau and cuts through the Permian Kaibab Limestone, which exposes the Toroweap Formation and Coconino Sandstone. Many settlement sites built by the Sinagua, Cohonina, and Ancestral Puebloans are scattered throughout the monument. About 2000 Ancient Pueblo People moved here to farm after an 11th century eruption of Sunset Crater. This video is all about Saguaro National Park.